Your day-by-day itinerary now includes Museo Nacional Centro de Arte Reina Sofia, Plaza de Espana Madrid, Jardines de Sabatini, and other attractions you added. There's much more to do: browse the exhibits of Royal Palace of Madrid, admire the striking features of Plaza Mayor, steep yourself in history at Templo de Debod, and pause for some photo ops at Puerta de Alcala. To find maps, photos, and more tourist information, you can read our Madrid trip website . Recife, Brazil to Madrid is an approximately 11.5-hour flight. You can also do a combination of bus and flight. You'll lose 4 hours traveling from Recife to Madrid due to the time zone difference. In February, Madrid is colder than Recife - with highs of 13°C and lows of 3°C. 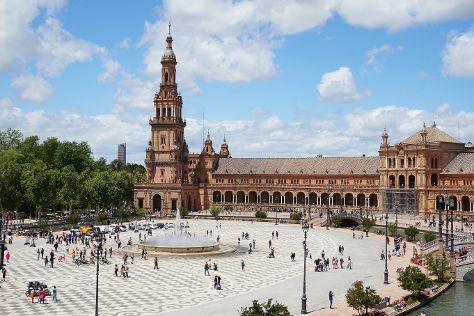 Cap off your sightseeing on the 4th (Mon) early enough to catch the train to Seville. Your day-by-day itinerary now includes Archivo General de Indias, Plaza Nueva, Plaza de Toros de la Maestranza, and other attractions you added. On the 5th (Tue), take in nature's colorful creations at Royal Alcázar of Seville, admire the natural beauty at Jardines de los Reales Alcazares, don't miss a visit to Plaza de Espana, don't miss a visit to Plaza de America, then brush up on your military savvy at Torre del Oro, and finally contemplate the long history of Plaza de Toros de la Maestranza. On the 6th (Wed), you'll have a packed day of sightseeing: make a trip to Metropol Parasol, pause for some photo ops at Plaza Nueva, take some stellar pictures from Seville Cathedral, then take in panoramic vistas at Torre Giralda, and finally take an in-depth tour of Archivo General de Indias. To find ratings, more things to do, reviews, and tourist information, use the Seville day trip app . Traveling by train from Madrid to Seville takes 3 hours. Alternatively, you can fly; or drive. Plan for somewhat warmer temperatures traveling from Madrid in February, with highs in Seville at 18°C and lows at 8°C. Finish your sightseeing early on the 6th (Wed) to allow enough time to travel to Valencia. 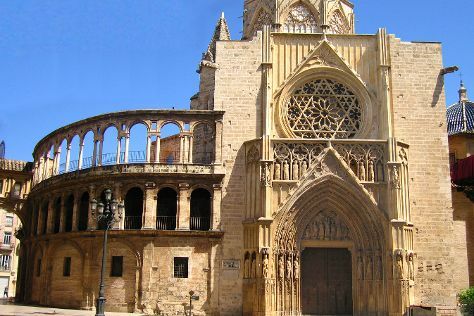 On the next day, steep yourself in history at Valencia Cathedral. For where to stay, photos, other places to visit, and more tourist information, read our Valencia trip itinerary maker tool . You can fly from Seville to Valencia in 3 hours. Alternatively, you can take a train; or drive. February in Valencia sees daily highs of 20°C and lows of 7°C at night. Wrap up your sightseeing by early afternoon on the 8th (Fri) to allow enough time to travel to Barcelona. You've added Parc de Montjuic, Placa Espanya, Columbus Monument, and other attractions to your itinerary. Next up on the itinerary: pause for some serene contemplation at Basilica of the Sagrada Familia, make a trip to Casa Mila - La Pedrera, appreciate the history behind Casa Batllo, and tour the pleasant surroundings at Parc Guell. To see photos, reviews, where to stay, and other tourist information, read Barcelona trip planner . Traveling by flight from Valencia to Barcelona takes 3 hours. Alternatively, you can take a train; or drive. When traveling from Valencia in February, plan for little chillier days and about the same nights in Barcelona: temperatures range from 17°C by day to 7°C at night. On the 12th (Tue), you're off tohome.